The Activity reports provide the deepest level of insight into activity by product and also allows you to save and download report data. Open your USS Dashboard and select Analytics. Select or search for the report name in the Reports & Charts tab. The Activity report type is identified with the icon. This means these reports return detailed results and support filtering. After selecting a report, the report will open in a new tab in the right-hand panel. Open the filters that are available for this specific report. 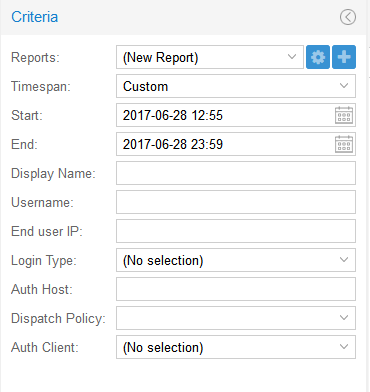 Run the report with the current timespan and filter selection. Save the report for use as a favourite or in report schedules. Switch to product management for the product this report belongs to. The Web Activity report is available as part of the Web Security product and is concerned with hits to websites, domains and IPs collected by agents or gateways deployed on your network. Web browsing generates a vast amount of data, and as such the hits are grouped into what are known as visits, to make the report more consumable. A visit, unlike a hit, has a start and end time. A visit is essentially a group of hits. When a new hit is received, the system will try and place the hit into a visit (i.e. if the time of the hit falls in between the start and end of a visit and is to the same domain by the same user or device, the hit becomes part of the visit). Visits have a threshold, meaning that if a user continually hits a website without leaving more than a minute gap between hits, all the hits (even if they last for hours or days) will be grouped into the same visit. For a visit to count as a distinct "Visit to a particular domain by a particular user", there has to be a time gap of a minute between two hits. USS does this because hits on their own are not very meaningful in terms of browsing habits and it also helps to reduce the amount of data stored. The Web Activity report supports filters that allow you to query the data with custom search criteria. 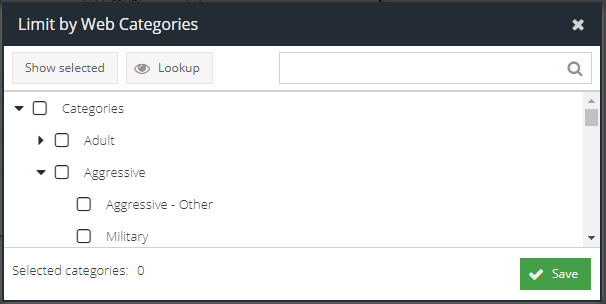 To set a filter, click the Filters button before running the report. The Web Activity report normally generates a lot of data. It is best practice to be as specific as possible with the search criteria. Part of the username (Active Directory) that made the web requests. This may only be available if agents are deployed with user identification or authentication. Part of the hostname of the device that made the web requests. Select the final action applied by a rule to the web request, e.g. Allow, Block, Redirect. 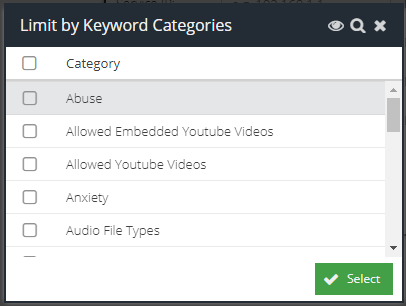 Check this box to open the category picker. This allows you to select multiple Web Categories that the web request must have matched. Check this box to open the AD Group picker. This allows you to select a group that the user who made the request must be a member of in Active Directory. 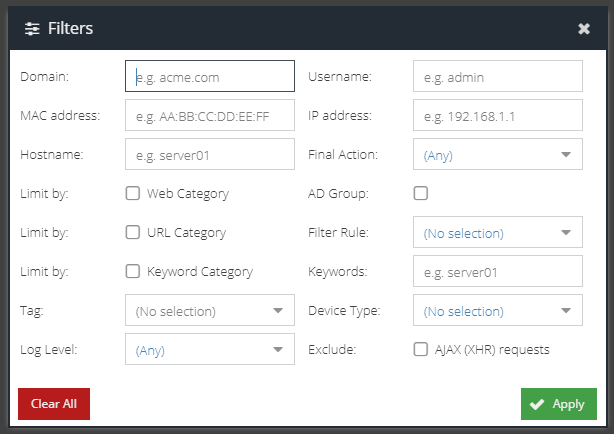 After the picker opens, select the AD Domain and then select the desired group. Only one group can be selected. Check this box to open the category picker. 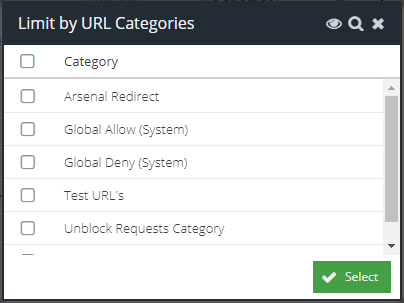 This allows you to select multiple custom URL Categories that the web request must have matched. The name of the Filter Rule that the web requests must have matched. This can also be used to detect sites blocked because they are "Unclassified" if this option is enabled. Check this box to open the category picker. This allows you to select multiple custom Keyword Lists that the web request must have matched. Enter in a Keyword List pattern that the web request must have matched, if you want to search on a specific keyword. Select the tag that must have been applied to the web request. Remove any web requests that were generated by scripts. This is a best effort attempt and looks for the presences of the XMLHttpRequest header. Click the icon to generate the report results. It may take several seconds to generate the report depending on the size of the result set. Very large reports may return too many results. Try to narrow the search criteria further using time or additional filters. The report results will appear in the Results panel and will be ordered by timestamp. The results are grouped by Visit. Click the + icon to expand the visit to see the individual hits belonging to the visit, including the full URL of each hit. The default columns are displayed but additional columns can be included in the report. 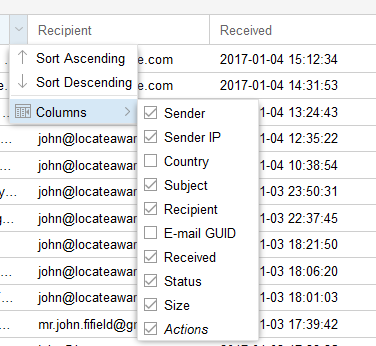 Hover over a column header, and expand the menu to view the available columns. You can add additional columns to the report which will be saved so that the same view appears each time the report is run. The local time of the first hit in the visit, or the local time of the hit. This is calculated by the Time Zone detected by the agent. The approximate time spent browsing the site, calculated by the timestamp of the first and last hit in the visit. This is an approximation only and may not reflect human behaviour. It is possible to sort the results on a particular column by clicking the column header to toggle between ascending and descending sort. Not all columns are sortable. 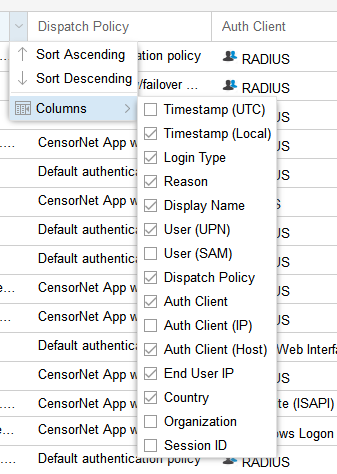 If a column is not sortable, the menu will be disabled. The App Activity (Inline) report is available as part of the Cloud Application Security product and is concerned with providing a detailed analysis of user activity within Cloud Applications (app's). 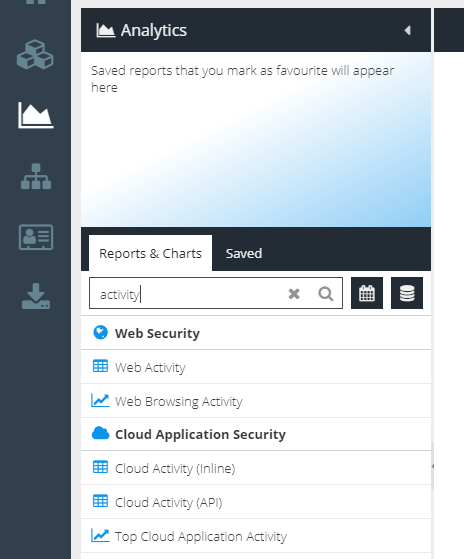 The App Activity (Inline) report is able to identify Shadow IT, by displaying the Cloud Applications in use in real time, the actions carried out within those applications (uploading, sharing, posting, etc) and even meta-data around the action carried out (file name, message, username, etc). This level of detail, combined with attributes from the App Catalog such as risk, provide a powerful insight into end-user behaviour and their use of Cloud Applications. Information from this report can be used to identify threats and sanction applications. Part of the username (Active Directory) that used the App. This may only be available if agents are deployed with user identification or authentication. Part of the hostname of the device that used the App. Check this box to open the category picker. This allows you to select multiple Keyword Lists that the request must have matched. 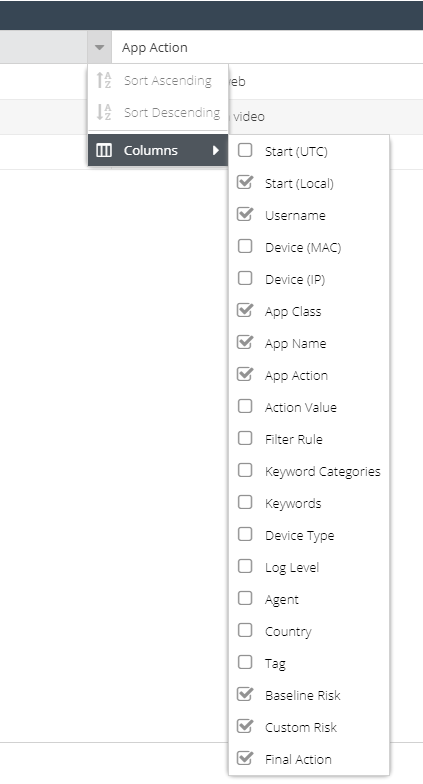 Check this box to open the Cloud Application selector and select a Class, Name or Action to search for. Select the final action applied by a rule to the request, e.g. Allow, Block, Redirect. One or more keywords (separated by semicolons) that appear in the captured Action Value meta-data. Useful for searching for filenames or Social Media activity. Select the tag that must have been applied to the request. The results are grouped by App Action. Click the + icon to expand the activity to see the meta data captured for the action. The App Activity (API) report is available as part of the Cloud Application Security product and is concerned with providing a detailed analysis of user activity within sanctioned Cloud Storage applications. The App Activity (API) report is able to scan files uploaded or created within Cloud Storage apps for malware, data leakage and inappropriate image content. The results are grouped by Event. Click the + icon to expand the activity to see the scan results each event. A valid E-mail Security license is required to use this report. Please contact your Service Provider for further information. 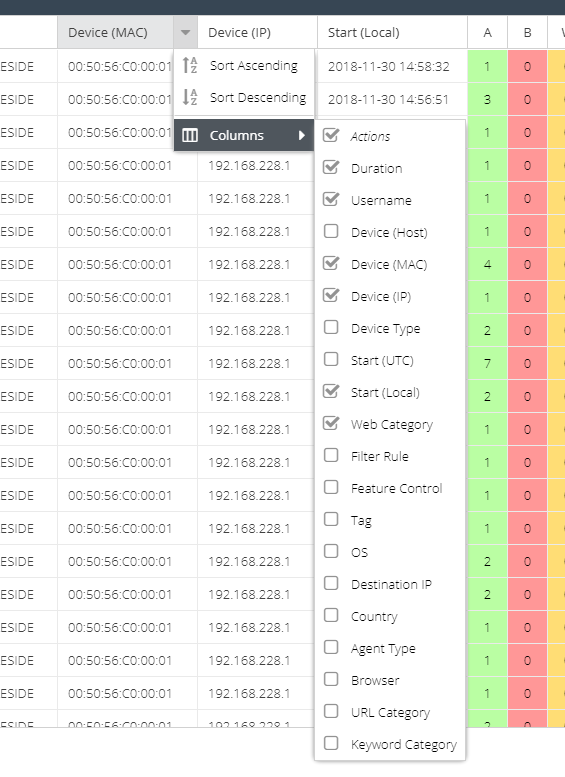 The E-mail Analyse report is available as part of the E-mail Security product and is concerned with auditing inbound and outbound e-mail processed by the E-mail Security product. It is the ideal report to track and trace e-mail delivery and to understand what e-mail rules have been applied to the message during processing. 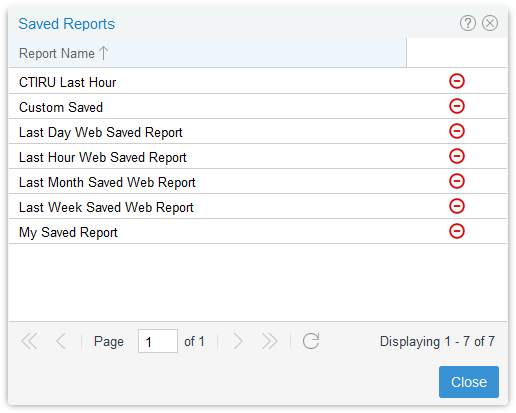 Select a previously saved report to load - see Saving and running Saved reports, below. Select a pre-determined time interval, such as Last Day, Last Week or Custom to enter in a specific start and end time. See Data Retention Periods for information on how much data is retained per product. Available if Custom timespan is selected, the start date for the search. Available if Custom timespan is selected, the end date for the search. Part of the message subject you are searching for. Part of the e-mail address of the recipient. Part of the e-mail address of the sender. Whether the message was inbound, outbound or either. The status of the message after processing e.g. Delivered, Rejected, Quarantined. The E-mail Analyse report also captures additional data for every message which is available in the Detail View. 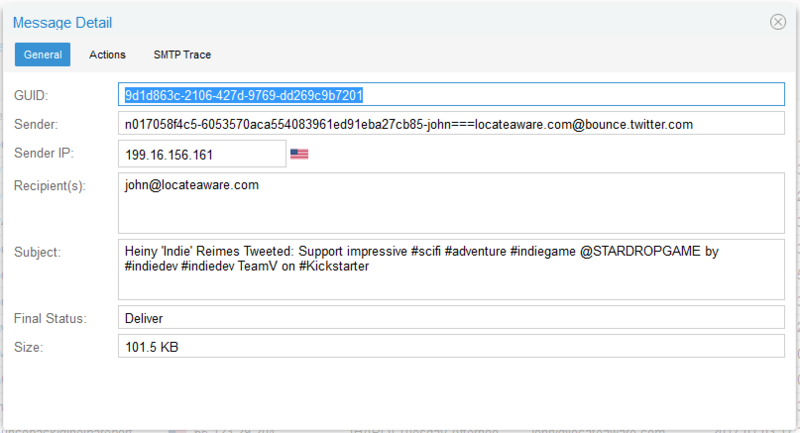 Click the icon to view the detail on a particular message, which is split up into General, Actions and SMTP Trace tabs. The Actions tab shows the rules that the message triggered as it was processed. This may help to identify why a message ended up with a final status of Deliver, Reject or Quarantine. A valid Authentication license is required to use this report. Please contact your Service Provider for further information. The Authentication Analyse report is available as part of the Authentication product and is concerned with providing protection for user account compromise through the use of weak or stolen passwords. Part of the users Display Name from Active Directory. 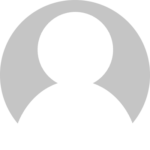 Part of the users Active Directory username. Part of the device IP that made the authentication request. Whether the authentication type resulted in a success or failure. Part of the hostname of the server running the Authentication Protection Client software. The dispatch policy that was used to issue the passcode for the authentication attempt. The type of Authentication Protection Client in use for the authentication attempt. To make more room to view the results, you can collapse the Criteria panel using the icon. Once a report has been generated by completing the search criteria, it can be saved so that it can be easily run again in the future or attached to a Schedule. When prompted, enter a name for the report. Click Save again. The report is now saved. The report is now available from the Saved Reports drop-down or within the Schedules section. Select a saved report. The saved criteria will be loaded into the form ready to be run. To run the report, click the button. To delete a saved report, click the icon. 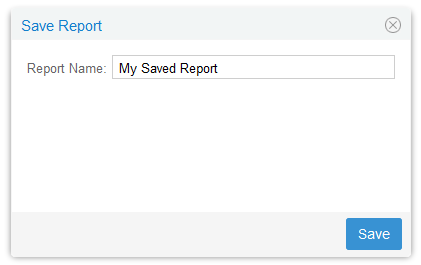 This will open the Saved Reports dialog. Click the icon to delete the Saved Report. 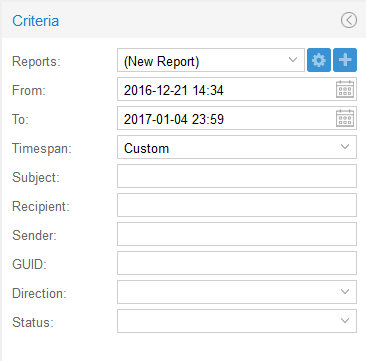 To export a report, first Run the report and generate results. This will display the Export menu option in the top right hand corner of the results. Reports can be exported as PDF or CSV (Comma Separated Values). PDF reports are limited to a maximum of 10 columns and 5,000 pages of data. If you require a larger report, use the CSV option. Clicking an option will trigger the report to be exported and a notice will appear. 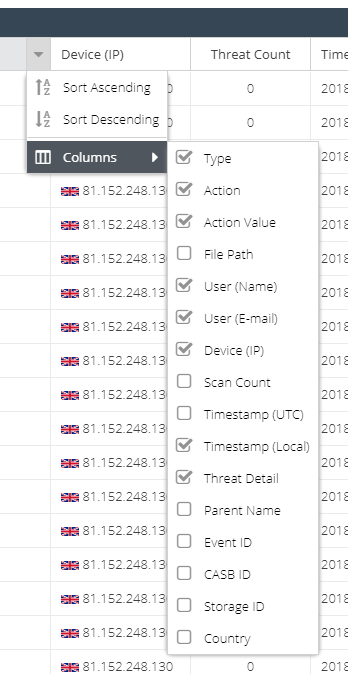 Large reports can take several minutes to generate. A further notice will be provided once the report is ready. If the report to export has more than 100,000 results then you will be prompted to convert to a one-time schedule and CSV format. Alternatively, reduce the size of the report by adjusting the search criteria and try again. Once the exported report is ready, you can view it in the Archived Exports list. Click Archived Exports button. Click to permanently delete the report. The report will also be available in the Analytics Archives section. A valid Gateway Anti-malware license is required to use this report. 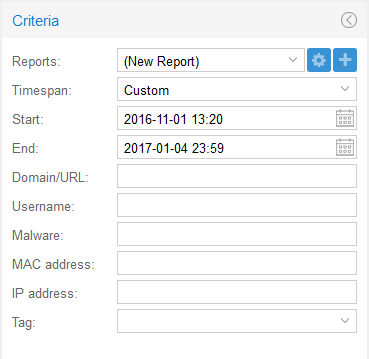 If you do not have a license, you can still use the Web Analyse report to identify malware hits using the Web Category search criteria. The Malware Analyse report is available as part of the Web Security product and is concerned with identifying web content that was blocked by the Gateway agent anti-malware scanner. Once enabled, the gateway anti-malware module scans all downloaded content (up to the maximum file size configuration setting) for malware and any positive detections are contained in this report. 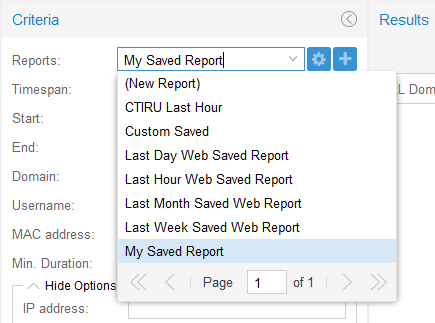 Select a previously saved report to load - see Saving and running Saved reports, above. 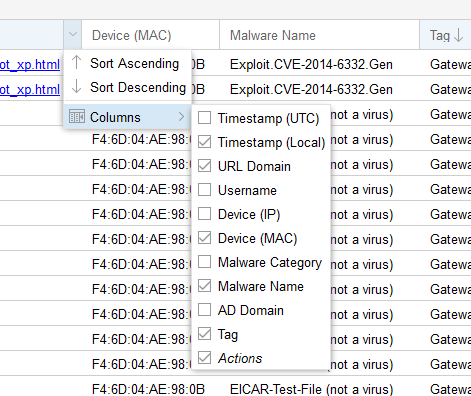 The Malware Analyse report also provides a link to the BitDefender virus database for further information on a particular Malware Name. Click the icon to view the detail on the BitDefender web site.